Like the famously wily Odysseus, Jane Addams often needed to think and act strategically. By the mid-1890s, the settlement house she co-founded, Hull House—which aimed to aid impoverished immigrants through wellness programs and cultural enrichment, and sought greater aims of political, social and economic reform—was still not attracting participation from the neighboring Greek community. 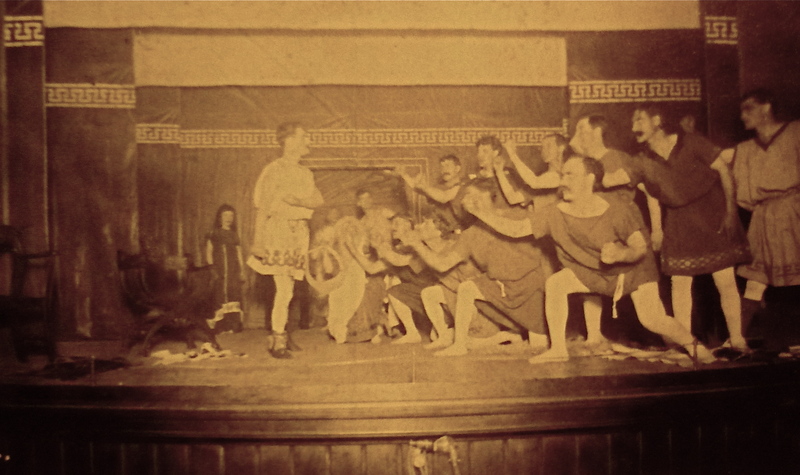 She noted in her book, Twenty Years at Hull House, that the newly arrived Greeks often felt “that their history and classic background” were “completely ignored by Americans.” To convince her Greek neighbors how profoundly Hull House valued their cultural heritage, Addams brought in Mabel Hay Barrows from Boston, a producer in her mid-twenties, to train a group of recent immigrants from Greece to stage a six-act play, The Return of Odysseus, based on the Odyssey, drawing on the original ancient Greek text of Homer. A resounding success, the production not only achieved Addams’ goal to bring the Greek community to Hull House, but it also proved to be a spectacular performance. The December 7, 1899 Chicago Daily Tribune review headline announced “Chicago Greeks Produce ‘The Return of Odysseus’ with Such a Spirit the Audience Gasps and Applauds” and identified the “climax” of the play as the boxing match between Odysseus and Phaeacian youths, in which the hero’s knockout blow was so realistic that not until “the actor reappeared in the next scene could many believe the fight was a sham.” For the past decade in Chicago, boxing’s popularity had been growing: Odysseus the triumphant boxer not only won the match, but also presented the ancient Greek world as prepared to enter the same ring as the present with artful strength. The Hull House production was a great success for the way it encouraged accumulating an understanding of many cultures instead of assimilating into a uniform one. Addams wrote, “You must not take away, you must add…[Has a child] been properly taught if he never learns to recognize that the Greek peddling bananas at the corner once wakened every morning in sight of the Acropolis, and what that sight has meant to him?” K.H. & J.H.